Defeat the bad guys before bedtime. Nice name, right? 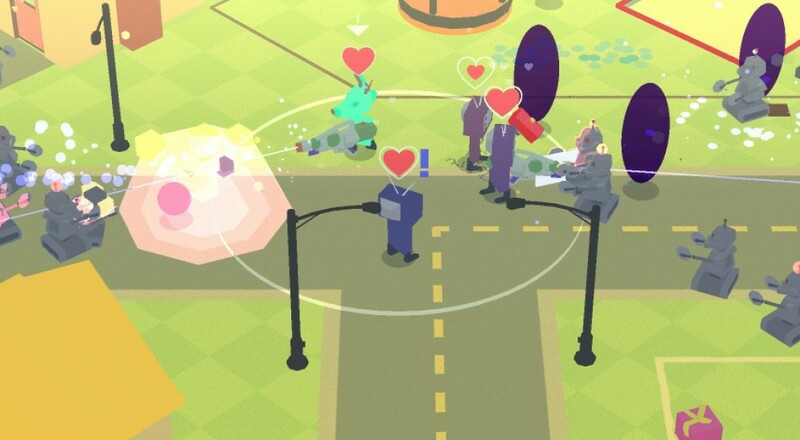 Fermenter Games' Neighborhorde is a four player couch co-op twin stick shoot-em-up that aims to bring a little levity into the horde-vanquishing shmup genre. It does this with colorful 3D visuals, crayon drawings of freaky monsters, and hair dryer weapons that shoot flames. In the world of Neighborhorde, you and your friends play way too many video games. Mom made you all go outside before your eyes rotted out of your skull. Too bad she there are more dangers out there than on the TV screen. Evil robots, dragons, wizards, and zombie Abe Lincoln burst out of trans-dimensional portals and start attacking everyone. You've got a wooden sword and some leftover bottlerockets from the 4th of July, so let's do this! Neighborhorde is inspired by the likes of Calvin and Hobbes and Ed Edd & Eddy. You know, if they fought zombie Abe Lincoln. It supports four local players and even has a single player mode in case your mom grounds you for not cleaning your room. The full release is scheduled for 2016, but you can check it out on Steam Greenlight now, if you wanna. Page created in 1.8417 seconds.